The Earth’s atmosphere stretches way past the Moon, much farther than previously believed, says a new study published in Space Physics. When the outermost portions of the atmosphere merge with outer space it emits a cloud of hydrogen atoms called the geocorona. According to the authors of the study, led by Igor Baliukin of the Russian Space Research Institute, this layer of gas reaches 50 times the diameter of the planet. 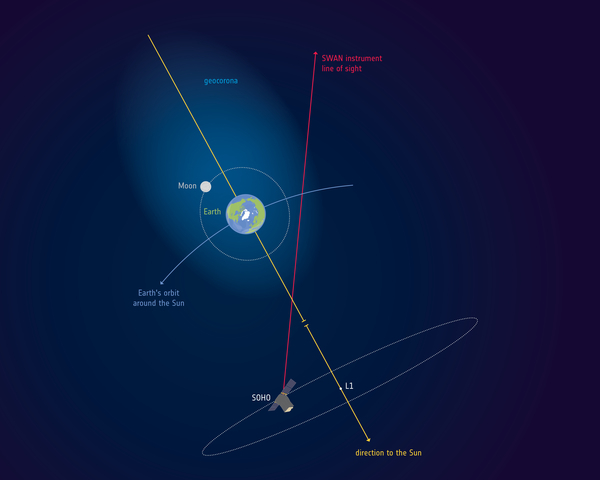 This widens the reach of Earth’s atmosphere roughly 330,000 miles (more than six times) further past what was previously estimated by the Southwest Research Institute, and makes the Moon almost a halfway point to where the outer reaches of the geocorona ends. “The Moon flies through Earth’s atmosphere,” said Igor Baliukin, lead author of the paper presenting the results, in an European Space Agency (ESA) press statement. The observations were captured by SOHO (Solar and Heliospheric Observatory), a satellite stationed roughly 930,000 miles from Earth’s surface on the side of the planet that faces the Sun. And they were made between 1996 and 1998, shortly after the satellite launched, when the SOHO satellite had a good vantage point to capture an ultraviolet image of the Earth’s atmosphere using sensors that can map the geocorona. “We were not aware of it until we dusted off observations made over two decades ago,” said Baliukin. The researchers stressed that data collected years ago could be used for new science. For example, they said the findings could have implications for researchers looking for other planets that have reservoirs of water. Planets that have hydrogen in their exospheres have a higher chance of having water on their surface. Scientists looking for exoplanets that might host liquid water—the key ingredient for life as we know it—could look for hydrogen in a planets’ geocorona as a means to infer the presence of water. Earth is a great comparison model for this kind of study. Who knows? Maybe hydrogen vapors will be the secret to finding a planet to inhabit if we happen to need a new one. < How has Sonoma County changed in the past 20 years?